Nathan Ford blames the death of his son on the rich. As a former insurance investigator, he knows a little something about big business sticking it to the little guy. He's lost it all, his job, his family, and even his self-respect to alcohol. Now he's taking it all back from the powerful and the corrupt, with a plucky team of ne'er-do-wells who'll help the downtrodden by giving them... Leverage. It's the A-Team again, which was Robin Hood again, but it's a smart, fun show and a phenomenal cast of crazy characters. The Hitter, The Grifter, The Hacker, The Thief... but it's the Mastermind who manages them, kind of like herding cats. Nate keeps all the schemes straight and all the plates spinning, he helps the weak and he helps himself and his sticky-fingered little helpers help you. 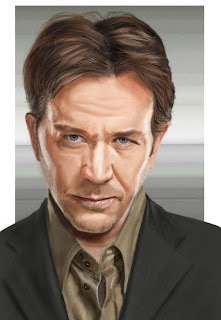 Timothy Hutton is a great performer: I liked him in the movie 'Ordinary People', and I like him in this TV series a lot. By turns Nate is tragic, comic, menacing, harmless, funny romantic, and a little amazing. Try some Leverage, you'll like it.